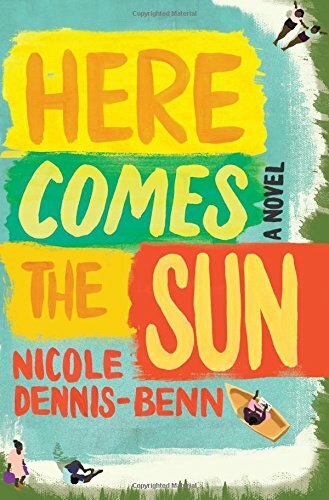 Nicole Dennis-Benn goes behind the bright sunshine, golden sands and blue seas of Jamaica that visitors see to explore the lives of four very different women. Beyond the tourist traps, many Jamaicans are struggling to survive as new developments threaten their already impoverished lives. Those who can leave, those who can’t wait and worry. Margot lives in a shack in River Bank, with her mother Dolores, younger sister Thandi, and her silent grandmother Merle. Margot works at a tourist hotel, supplementing her salary by providing ‘personal services’ to the rich men who book in. Dolores sells souvenirs and trinkets to the visitors who arrive on cruise ships, but business isn’t good. Both women work to send fifteen-year-old Thandi to an expensive school, vowing that she will have a better life than either of them have known. Thandi, who has to deal with her mother and sister’s expectations that she will become a doctor and leave River Bank far behind, wants to be an artist. She also fall in love with a local boy of whom Dolores disapproves. Margot may prostitute herself with guests and her boss, but it is Verdene, the village outcast, who holds her heart. Verdene lives alone in a pink house, shunned because she was caught with another girl at college and sent abroad in disgrace. Verdene came home when her mother died but she is still considered a witch by all save Margot. Their love puts them both in serious danger. The girl that Verdene was with at college was raped and murdered when she went back to her home town. Verdene worries that Margot may be subject to the same fate, so their affair is conducted under the cover of darkness. Dennis-Benn excels in laying bare the love/hate nature of the relationships between the women. Margot and Dolores are constantly sniping at each other, trying to score points and have the last word. There is an unspoken anger hanging in the air between them that is almost tangible. Dolores feels that life has dealt her a bad hand and can’t understand why her daughters aren’t more grateful to her. Margot feel she owes Dolores nothing, having sacrificed her young body to earn the money that will be her passport out of River Bank and away from Dolores. Both women adore Thandi but the daily pressure they put upon her to do well at school is taking its toll. Dennis-Benn roots the story firmly in Jamaica by using local patois in speech which has a musicality and poetry all of its own. Through Thandi she shows the discrimination against girls with dark skins and the lengths some will go to in order to have the light brown skin that is considered beautiful. It is another desperately sad example of healthy young women being told they are not enough in themselves. 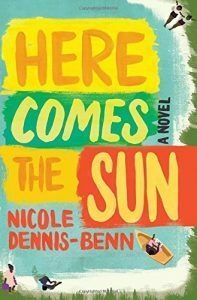 Here Comes the Sun is a wonderful exploration of the very particular world in which these four women find themselves. All of them are looking for a better life away from the poverty of River Bank, all of them wanting to share in the seemingly perfect lives of the rich tourists. It is a very different view of Jamaica, but it feels more honest and authentic than the glossy travel brochures.